Trees grow. It’s what they do. And at some point, they grow so much that they start to impede on other parts of your property. It’s at this point that you need to hire a tree service in order trim them, prune them, or cut them down. But not all tree services are created equally. There is quite a bit separating a legitimate tree service and one with only rudimentary experience. So how do you ensure that you’re hiring a legitimate tree service? By asking these 8 vital questions, that’s how. The best way to determine whether or not a tree service is legit is by finding out whether it’s got any legitimate certification. Any service worth its salt will be a member of an organization such as the International Society of Arboriculture or an equivalent organization. Services that don’t have this designation might do a decent job, but you shouldn’t risk it. It’s also necessary to make sure that your perspective tree service is in possession of the proper insurances. If it’s not, you could be on the hook for any damages or injuries that occur on your property. At the very least, make sure the company has liability insurance and worker’s compensation insurance. The best way to understand a service’s tree care capabilities is by asking for references from past customers. Companies which can’t provide references likely can’t do so because they don’t have any good ones. 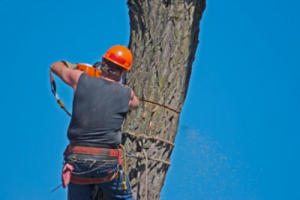 Tree services handle all different types of tasks, from stump removal, to pruning, to trimming, and more. Make sure, when speaking to a tree service, that you ask how the service will perform your particular task. Perhaps the most important question to ask when hiring a tree service is if you can get an estimate of the work that is to be done. Never have work done before receiving an estimate. You don’t want to be surprised by an outlandish figure that you can’t afford. Looking to Hire a Tree Service? Are you looking to hire a tree service? Do you live in the Chicago area? If so, Smitty’s Tree and Arbor Service is the company you’re looking for. We here at Smitty’s provide services of all kinds. Not only do we remove and trim trees, but we also supply mulch, firewood, and a bevy of other yard products. If it has to do with trees, we can handle it. Contact us right now to get started!